CHARLESTON, W.Va. Gov. Jim Justice and his senior adviser appeared in a cross between a political ad and infomercial Monday evening, paid for by a group headed by a longtime aide to former Massey Energy Co. CEO Don Blankenship. The 30-minute segment, titled “Perfect Storm,” aired on WVVA, an NBC affiliate based in Bluefield. 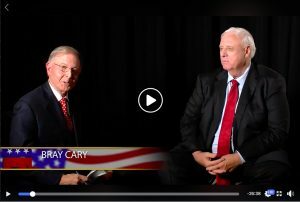 It consisted of Bray Cary, an adviser to Justice and board member of publicly traded natural-gas driller EQT Corp., interviewing the governor about the potential goodness of Republicans if they swept Tuesday’s elections. The ad was paid for by West Virginians for Fair Courts, which is headed by Greg Thomas, a longtime GOP consultant in West Virginia and campaign manager to Blankenship for his Senate run in the Republican primary earlier this year.